Blueberry season is upon us! Fortunately for fruit lovers in the Sandy area, there is a bounty of berries at their fingertips at numerous u-pick farms. 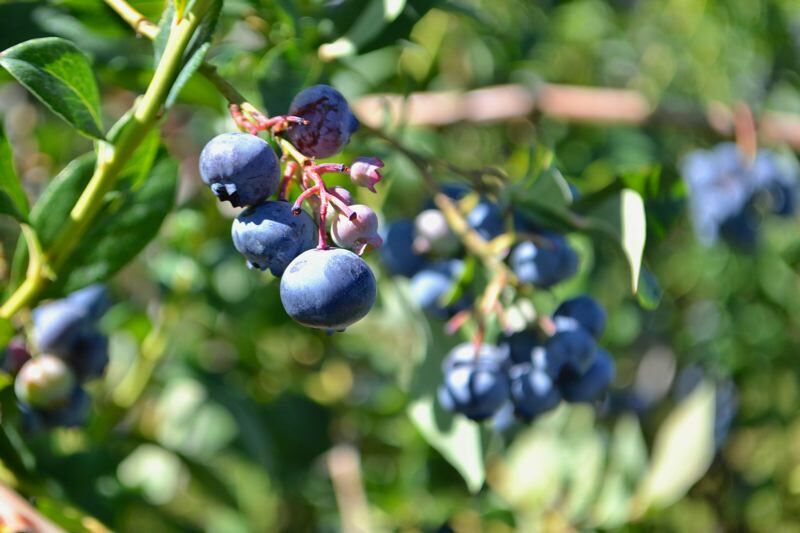 The Oregon Blueberry Commission has projected a 130-million-pound yield of blueberries statewide for this year, an increase of about 20 million pounds from last year. If you want a piece of the pie — or rather, pie-making produce — the time to pick is now. Art and Judy Ebert's Oregon Blues farm has always been a u-pick, but the couple has been growing their Oregon blues at 9751 S.E. Telford Road, Boring, since 1988. In 1997, they opened the farm as the hands-on, family experience it still is today. "Our friends were in raspberries, so we thought 'why should we compete with them,'" Judy explained. So far that decision has served them well for about 30 years. "It's a family thing — a tradition," she added. "Meeting people (is my favorite part). I'd say 99 percent of the people who come out here are wonderful." Some of the people who come out today have been customers since the 1990s. The Eberts' season usually opens around July 5 and can close as late as Aug. 7. This year, greatly because of heat, the season at the Eberts' farm didn't start until July 20, so there's still plenty of time to go out and pick. So far, Judy told The Post, "(the blueberry yield) has been low." "(The berries) need heat for sweetness and ripeness, but too much and they shut down," Judy said. The heat also "makes people not want to come out," Judy added. The berries are bursting into full color and there are another four weeks for people to go out and find not only an abundance of blueberries, but also recipe recommendations from Judy. 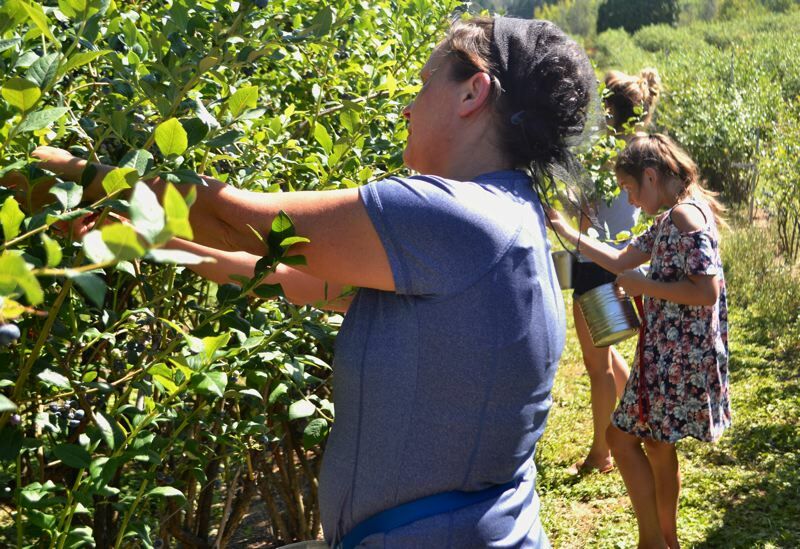 Berries go for $1.50 per pound and buckets are provided at the farm. The farm is open with berries ripe for the picking from 7 a.m. to 6 p.m. Monday through Saturday. Most people who live in rural communities have probably heard the acronym "CSA," meaning community supported agriculture. They're programs, which allow connoisseurs of local produce to sign up and receive regular batches of farm-fresh foods. At Klock Blueberry Farm, 931 N.E. Salzman Road, Corbett, Pete Guagliardo has applied the CSA model to his blueberry u-pick farm, helping make the farm not only more sustainable, but offering a unique chance for berry-lovers to get first pick. Guagliardo is the son-in-law of Clair and Beverly Klock, original owners of Klock Farm, and now handles the u-pick operation. When The Post visited Guagliardo's operation, the farm was exclusively open for members. Jim and Sally Torson were among those specially invited to pick. 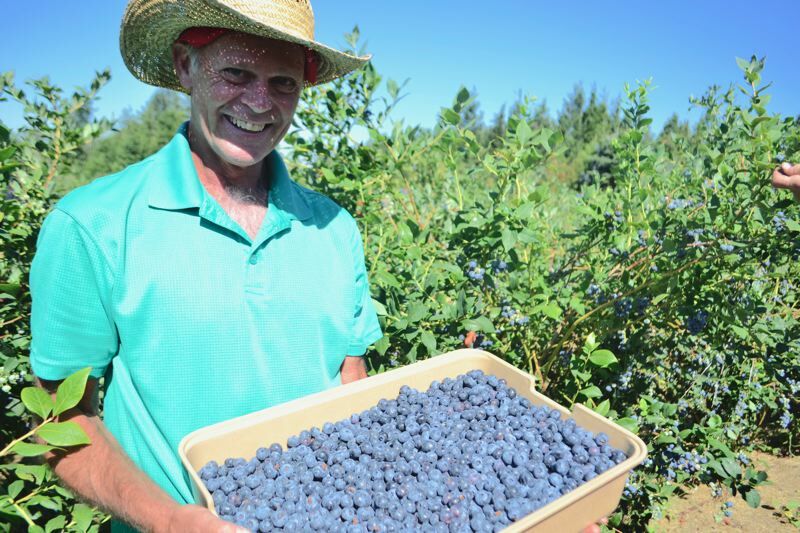 The couple has made Klock Farm their destination for blueberries for the past nine years, and are first-time CSA members this year. "It's easy picking and nice company," Jim said when asked why his family chooses Klock Farm. He also is a fan of Guagliardo's very deliberate picking planning. "Most u-picks you arrive and grab a bucket and pick wherever," Guagliardo explained. "But here, we do assigned picking." In order to make sure no customer goes home empty-handed or spends hours combing through not-quite-ripe berries, the Klock Farm team hunts down the ripest spots and then assigns them to customers as they arrive. "It creates a really positive experience for the customers," Guagliardo said. Sitting at approximately 1,000 feet in elevation, Klock Farm, Guagliardo added, ends up starting its season about two to three weeks later than other area u-picks. The Klock Farm season typically runs from Aug. 1 through mid-September, though this year the fields were already open by the end of July. Besides its unique business model, Klock Farm also prides itself on the amount of varieties grown at the Corbett berry fields. "A lot of our members are dialed into our varieties," Guagliardo noted. And Klock Farm has seven to choose from, including everything from Ivanhoes to Elizabeths. The one thing that is a true constant across the field is that the Klock Farm team provides excellent customer service, and the friendliness of the staff translates into a amicable and fun experience on the farm for all. "Our customers have been coming here for so long and are so friendly," Guagliardo said. "I look forward to the picking season, seeing faces I only see once or twice a year. It's just one big social scene." Klock Farm is open from 8 a.m. to 2 p.m. Friday through Sunday for the next four to five weeks. Friday-Sunday 8 a.m. to 2 p.m.